Dinner and a (Game) Show for a Cause! 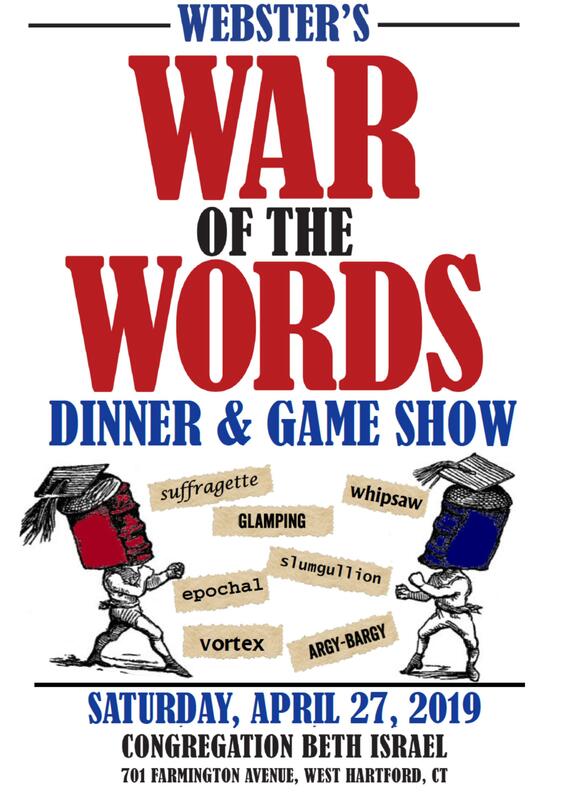 Please join us on Saturday, April 27, 2019, for the 10th annual Webster’s War of the Words, the signature fundraiser of the Noah Webster House & West Hartford Historical Society. At this fun night out, guests will enjoy dinner, drinks, silent and live auctions, and the main attraction – the word-based game show! Tickets are only $60, but seating is limited. Get your tickets today! Words are more important than ever. If you’ve been following current events, words like ‘vortex,’ ‘suffragette,’ and ‘collusion’ might take on a special meaning for you. At Webster’s War of the Words, the mental prowess of two teams of local celebrities – and the audience – will be tested in a lively and interactive battle of words and wit in categories such as “Trending Words,” “Definition Stumper,” and “Name That Book.” What better way to pay homage to the Father of American English than a game show fundraiser in his honor? Former NBC Connecticut anchor and reporter Brad Drazen returns to emcee this fundraiser, along with Peter Sokolowski, noted lexicographer and Editor-at-Large at Merriam-Webster Inc., who will serve as game show host. Contestants include West Hartford’s own, Rob Kyff, “The Word Guy” language columnist for The Hartford Courant and educator at Kingswood Oxford school; Wall Street Journal language columnist Ben Zimmer; Merriam-Webster lexicographer Emily Brewster; New York Times columnist and science author Carl Zimmer, and more. The evening will also include both silent and live auctions. Each basket in the silent auction is inspired by a book in keeping with the museum’s mission to promote literacy. Live auction items include a week-long stay in Nantucket and an African safari. All proceeds from the event benefit the birthplace of Noah Webster, a 501 (c) 3 non-profit. 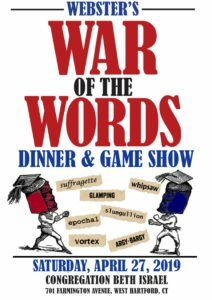 Webster’s War of the Words takes place from 6-9 p.m. at Congregation Beth Israel, 701 Farmington Avenue in West Hartford. Advance purchase tickets are $60 and include dinner, dessert, and drinks (beer and wine). After April 24, all tickets are $75. Groups of 8 may purchase full tables for $440, a $40 savings. Tickets are available at noahwebster.yapsody.com or by calling 860-521-5362 x10. This event would not be possible without the support of our sponsors — Gold Sponsors Reid and Riege, P.C. and Tsunami Tsolutions; Silver Sponsor Ziegler; Bronze Sponsors The Mercy Community and Merriam-Webster Dictionary; and Patron Sponsors Petcare Veterinary Services; Duncaster; Thomas Fahy Insurance Agency, Inc., and Harvey & Lewis Opticians.